Here at Bongo Towers we are of the firm opinion that it is best to buy a Bongo from a reputable dealer. After all, if someone is selling a Bongo for under £4,500, there has to be a reason, doesn’t there? The following tale was sent to the owners club and illustrates this point rather well. All names and locations have been changed to prevent any further trouble. “I should like to say that buying a Bongo should have been a happy experience for us as a retirement vehicle”, writes Mr X of Hertfordshire. “We love the outdoor life but as pensioners we could not justify the expense of a full motor home. With hindsight I wish that I had gone to one of the specialist Bongo dealers. Instead we have had the most horrendous experience of our life that has reduced my wife to tears and myself to a nervous wreck and unable to sleep at night for fear of recrimination from the most evil and unscrupulous motor trader it has ever been my misfortune to deal with. I was looking for a decent part exchange for my Toyota LiteAce which was 100% reliable with a full service history. I approached one of the main Bongo dealers, but they were not keen on taking an older vehicle, so I started looking elsewhere with a view to having the Bongo converted at a later date. I then saw an ad in the paper for a low mileage Bongo at a local dealers. We went and had a look. The vehicle was well presented with a service, road tax and warranty. They also did part exchange. On a test drive the engine seemed a little noisy, but I was assured this was just a stuck hydraulic tappet as the car had been standing for some time in Japan, but all would be fine when we came to pick it up 2 weeks later. After we drove the car home, the next morning I noticed oil and anti-freeze leaking from underneath. In some alarm, I called my local service man. He put the car on a hoist and took off the under tray. We saw that the whole engine and gearbox had been taken out and the sump removed, and the four-wheel drive shafts were both split and leaking. 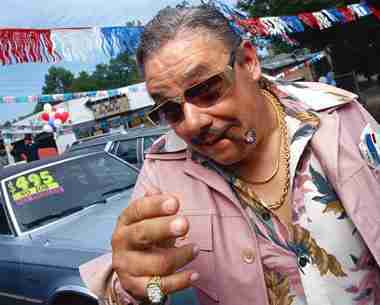 I phoned the dealer who just said that I should list all the faults and return it! I demanded a full refund and my old car back. This was refused point blank and I was offered another Bongo, or wait until the other one was repaired. I was not prepared to accept this, and so the manager intervened and the atmosphere became very threatening on a “take it or leave it” basis. With my wife becoming increasingly nervous we decided to take the different Bongo subject to my mechanic’s inspection. This vehicle turned out have a broken anti-roll bar bracket and various other faults, so they offered me a £500 refund. I was left with no other option than to accept. OK, I know I should have gone to Trading Standards, but these dealers know our address and we feel intimidated and know that if we kick up trouble we would have a visit in the middle of the night. It turned out that unlike the original vehicle this replacement Bongo was a very basic model with no central locking, no electric mirrors or blinds and not even correctly matching seats. Following this letter I made some investigations and, by a process of elimination, found out the name of the firm involved, and they have now been added to my black list. But I felt that I could do little more other than publicise this horrible tale on the website as a warning to others.